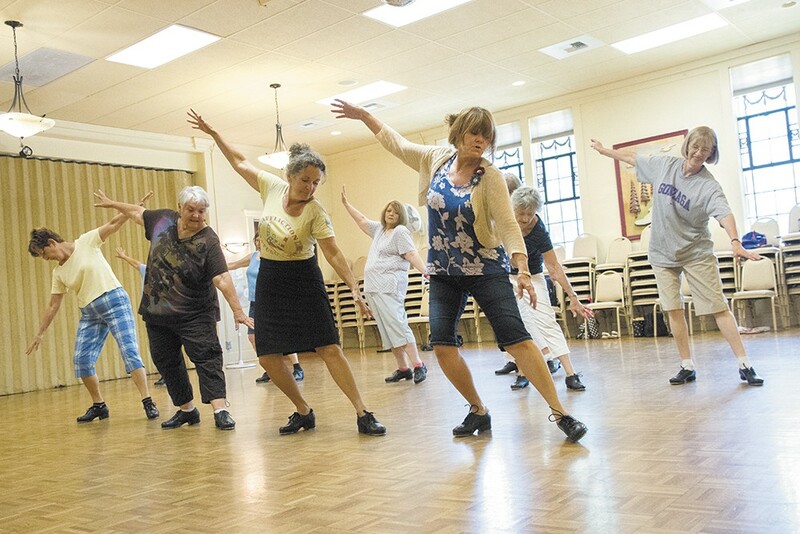 As Spokane's Tap Grandmas perfect a routine at rehearsal, both their brains and bodies are getting a beneficial workout. The sound of thunder rolls across the parquet flooring of the Corbin Senior Center. Stomp! Tickety tickety clack. Three lines of grinning female tap dancers click a circuitous path forward and back, miming thumb-and-pinky telephones to the swing of Glenn Miller's "PEnnsylvania 6-5000." When the last brassy note of the song rings out, the women rest, grab a drink of water. Then their instructor shouts, "Let's do the Charleston!" and the dancers, winded but exuberant, launch into a choreographed unison of swinging arms and bowed legs. These are the Tap Grandmas. Led by Joan Hamilton, a retired gym teacher, they range in age from 60 to 84. "It's fluid motion that keeps them engaged," says Hamilton. "I always tell them that at the end they're going to be able to join The Rockettes." Ask one of the Tap Grandmas why she's here on this sweltering Thursday morning, and she'll probably say it's for the fun and socialization. But exercise like this is actually providing a host of interrelated benefits: increased strength, improved coordination, better balance. All of which can help prevent falls. The term fall might sound fairly benign, but it's serious business for all age groups — and the elderly in particular. The World Health Organization estimates that, each year, 28 percent to 35 percent of people aged 65 experience a fall. For those past 70 years of age, the incidence is even higher at 32 percent to 42 percent, and among that demographic, falls can end with a hip fracture or head trauma. Although injuries can be but aren't usually fatal, they can still result in hospitalization, follow-up surgeries, lengthy rehabilitation and diminished mobility afterwards. In the United States, the combined medical costs for falls treated in the emergency room for those aged 65 and up totaled $6.3 billion in 2005, according to data from the Centers for Disease Control and Prevention. In 2013, the inflation-adjusted direct medical costs of falls among older adults totaled more than $34 billion. With a view to sparing aging adults that physical, emotional and financial pain, Ellen Pell became a proponent of the Stay Active and Independent for Life (SAIL) exercise program while serving as director of Wellness Place in Wenatchee. She moved to Spokane about a year ago with the hope of getting the program running locally. "We had a good working relationship with physical therapists and physicians," says Pell, "and we found that we were not only getting people aged 65 and over, we were starting to get people who were recovering from cardiac arrest, traumatic brain injuries, people with Parkinson's, people with MS. SAIL's slow, rhythmic program doesn't just help to increase their heart and muscle strength but also elongates those muscles and keeps them more flexible." "If you don't use it," Pell adds, "you lose it." That mantra is repeated by Kimberly Cleary, a professor in Eastern Washington University's College of Health Science and Public Health. "That saying really applies to older adults," says Cleary. "As physical therapists, we see this vicious cycle where older adults start to have problems getting around, so they stop doing as much. They impose limits on themselves. And then you end up losing muscle mass, losing aerobic capacity, and it's hard for people to bounce back." However, she stresses the importance of finding a physician-approved exercise regimen before deciding to dive in. "It can be safe for older adults to engage in vigorous exercise — absolutely," Cleary says. "But if an older adult is new to exercise, it's really critical they get checked out first. And it's also critical that they build up gradually. A lot of people want to jump in with both feet. Easing in is important." The notion of "use it or lose it" applies to the mind as well as muscles. Both Pell and Cleary say that mental acuity — awareness of one's surroundings, the ability to react to unexpected situations — is an often overlooked but crucial area of fall prevention. Pell witnessed the results firsthand with SAIL. "We saw an increase in mental clarity as well as physical aspects — just by integrating exercises where we'd throw a ball and you'd name your favorite pie or what child is your oldest. That part of it was really impressive to me." By tracking routine fitness checks of individual SAIL participants, Wellness Place has been able to point to overall increases in core strength, agility and mobility, not to mention emotional and social well-being. What's more, recent research has shown that moderately strenuous exercise involving active response, such as dance, actually enhances the "neuroplastic benefits" of that activity. Which is to say, more than just addressing basic strength and balance, it keeps the brain's neurons limber and working in harmony with the musculoskeletal system. For Cherie Beckstrom, all those rewards are icing on the cake. She joined the Tap Grandmas last December, just days after she turned 70. To learn more about the Tap Grandmas, contact Joan Hamilton, tapgrandmas.com, 624-4758. Contact your local senior center to find out more about SAIL and other classes, or check out spokanecares.org/community-centers-spokane. For general information on fall prevention, contact the Spokane Regional Health District: srhd.org/topics/falls.